This magnificent waterfall at the village is an ideal local for a picnic. Nature lovers feel very much at home at the Cocoa Culture Spring which is surrounded by lush greenery. The village has two main waterfalls and four mini cascades. A magnificent sight to see this 30-foot waterfall surrounded by large shady trees, the morning sun streaming through the branches. Cocoa Culture Spring is opened to the public and it is ideal for picnics and get-togethers of families and friends. Cocoa Village is 30 minutes drive from Tawau International Airport. This sprawling cocoa plantation estate has miles and miles of cocoa trees as far as the eye can see. From blooms to green fruits to ripe brown pods, it was a myriad of colors and the air was filled with the scent of fresh cocoa fruits. Sabah, The Gourmet Chocolate Capital of the World, is one of the world’s top cocoa producer, along with Ivory Coast, Ghana and Indonesia. 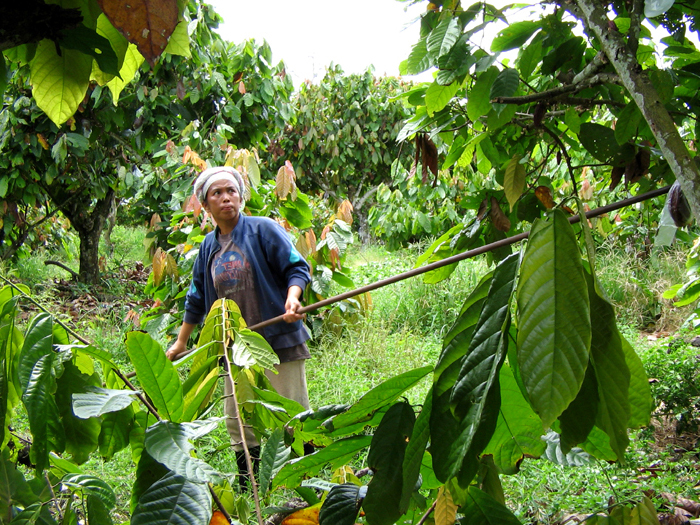 Godiva and M&Ms, among many other producers, use Sabahan cocoa. 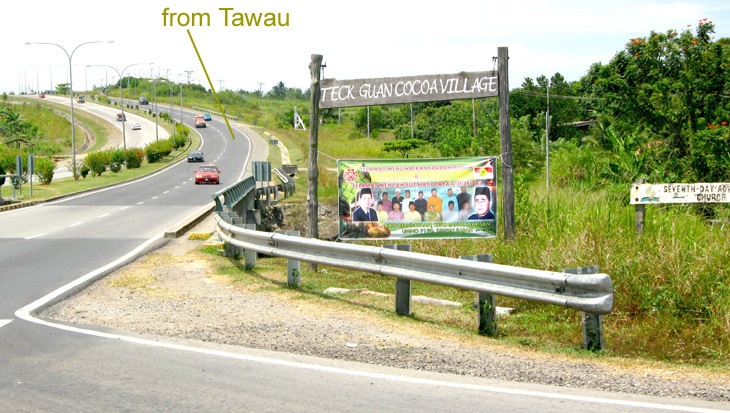 Visitors to Tawau notice cocoa plantations dotting the land. Beside Hills Park is a one thousand-acre Teck Guan Cocoa Village with its own factory and accommodation for overnight visitors. Teck Guan Cocoa Village offers a two-hour long tour of the village showing off cocoa trees and cocoa fruits in the midst of the very fertile volcanic soil. At a different location is Teck Guan Cocoa Musuem at Tanjung Batu Laut managed by Majulah Koko Tawau Sdn Bhd. Few bumpy kilometers from the main entrance is a hiking trail which leads to a magnificent waterfall. It was truly a magnificent sight to see the 30 feet waterfall surrounded by large shady trees and the morning sun streaming through the branches. 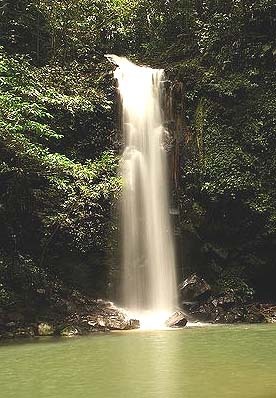 The waterfall is opened to public and that is an ideal place for family picnics and get-togethers. Hotel Emas (Company No. 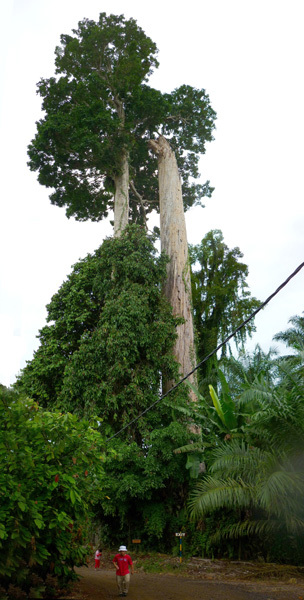 013522-D) TB2103, North Road, 91000, Tawau, Sabah, Malaysia. Emas Hotel in Tawau has details of tour packages to Teck Guan Cocoa Village and Teck Guan Cocoa Museum. Visitor may make visit arrangement through Emas Hotel. - Minimum 2 persons on twin sharing basis in a deluxe room. Higher category of room such as suite rooms are available for guests who wish to pay a bit more for luxury and comfort. 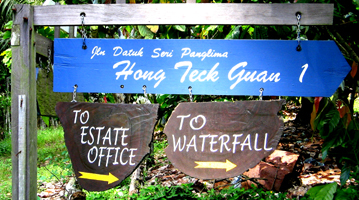 - Minimum 3 days advance booking Tour to Teck Guan Cocoa Village & Teck Guan Cocoa Museum. AMETONADO cocoa : Since 1957 Teck Guan has been planting these specially selected, fine-flavored AMETONADO cocoa in the fertile volcanic soil around the Quoin Hill volcano area. AMELONADO is superior in its rich cocoa flavor but not easily grown. 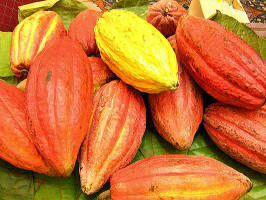 A few other cocoa plantations have tried cultivating AMELONADO cocoa but failed. Today Teck Guan is the largest and successful AMELONADO cocoa producer in Malaysia. From these best cocoa seeds processed into fine cocoa powder using up-to-date, state-of-the-art modern processing machines. TAWAU’S claim to fame is cocoa. The town is dotted with many cocoa plantations that have opened their doors to tourists who are keen to learn more about cocoa. 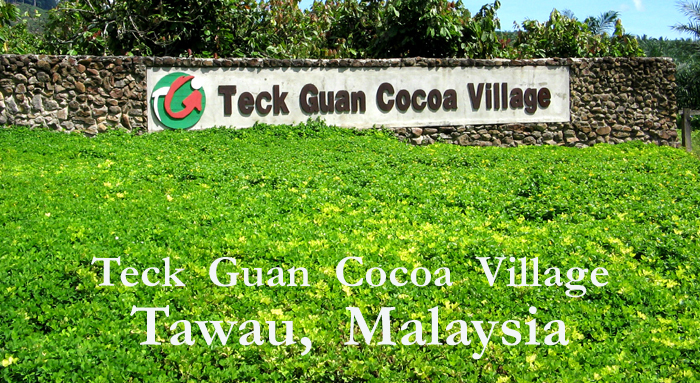 Teck Guan Cocoa Village is more of a plantation and cocoa processing plant than a village with 1,000 acres cocoa trees. Tawau Town is the main producer and distributor of cocoa in the state of Sabah. Teck Guan Company started planting cocoa in 1957 and now has 6,000ha of cocoa plantations in Tawau and Semporna. 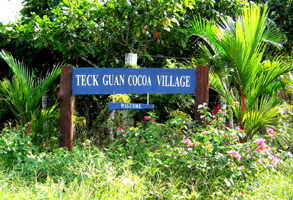 Teck Guan Cocoa Village is around 1000 acres in size. The sprawling estate has miles and miles of cocoa trees as far as the eye can see. From blooms to green fruits to ripe brown pods, it was a myriad of colors and the air was filled with the scent of cocoa. Fruit trees are also grown around the area. Tawau Town is the largest cocoa producer in Malaysia. This has led to the construction of the Malaysian Cocoa Research Centre in Apas Balung, located about 30 km from the town centre. Before visiting to the Cocoa Village many visitors think cocoa is produced from coffee beans and are surprised to see the cocoa tree and fruit. Even Malaysians do not know this and a visit to the village is an educational trip for many. Teck Guan Cocoa Village is one of the earliest plantations to cultivate cocoa in Tawau where the volcanic soil is most suitable for this crop. Tawau is one of the top cocoa producers in the world along with the Ivory Coast, Ghana and Indonesia. Zero-Shade Cocoa Planting A method by Teck Guan Chairman, Hong Ngit Ming. Cocoa yields have tripled in small estates and big plantations worldwide as well. .
Commercial planting of cocoa for the last 400 years was all under shade cover - Cocoa was originally found growing under jungle; it was thought that cocoa needed shade. Mr. Hong reasoned that since mango and citrus trees, first found growing in the jungle could be grown in the open fields without shade. The same could be applied to cocoa trees. Others before him attempted some isolated research and trial but all failed. Mr. Hong, through his own unique experiments and research made the breakthrough that cocoa trees could grow vigorously without shade in open fields. Hence the name " ZERO-SHADE COCOA". 1. Cocoa yields have tripled and hence lower cost of production - sustains the cocoa businesses during abnormal climatic condition and eroded commodity prices. 2. No more shade planting; hence lower cost of planting and no competition for moisture during drought. 3. Precocity - yield much quicker, hence lower capital outlay, earlier and higher payback. Here, visitors are taken on a two-hour guided tour to see how cocoa is cultivated, harvested, fermented and dried before it is sent to the factory. A few bumpy kilometers from the main entrance is a hiking trail which leads to a magnificent waterfall. Teck Guan Cocoa Museum : To complement this visit, visit also Teck Guan Cocoa Museum in the town about 30 km away in Tanjung Batu 10 minutes from Tawau Town Centre. The exclusively decorated and comfortable museum officially open its door for visitors in 2004. Visitors will learn about the history of cocoa and will also be able to see the cocoa and chocolate manufacturing process. The moment you set foot in this cocoa museum, you will sense the lovely aroma of cocoa permeating the air.